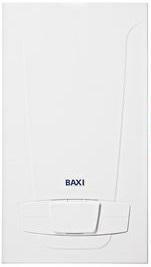 The 124 Combi is a wall mounted combi gas boiler by Baxi. This boiler is B rated for both heat and water delivering an impressive efficiency rating of 89.1% and an output of 24kW. As with most Baxi’s this boiler is compact & lightweight so can fit inside a standard 300mm deep cupboard making it a perfect boiler to hide away discreetly or even for those more modest properties with smaller kitchens. This boiler comes with a user friendly control panel and display, with it also weighing in at just 32.5kg it makes it easy to transport, unpack and install. This boiler has easily accessible components to help with installation and any servicing it may need in the future. The 124 combi boiler has a leading choice of flue lengths, bends and accessories to help with the flexibility of where the boiler can be placed in your home. The combi gas boiler is also available with a 28kW output and both come with a 2 year warranty.